Robert Kubica will complete an astonishing comeback to a full-time F1 seat by driving for Williams in 2019. The Pole, who suffered career-changing arm injuries in a rallying accident over seven years ago, will partner George Russell. Kubica, who narrowly missed out on a seat with Williams for 2018, is believed to have rejected a development driver role with Ferrari in order to make his return to the grid. "It has been a challenging journey to make it back to the Formula One grid, but what seemed almost impossible is now beginning to feel possible," said Kubica. "Being back on the F1 grid next season will be one of the greatest achievements of my life." 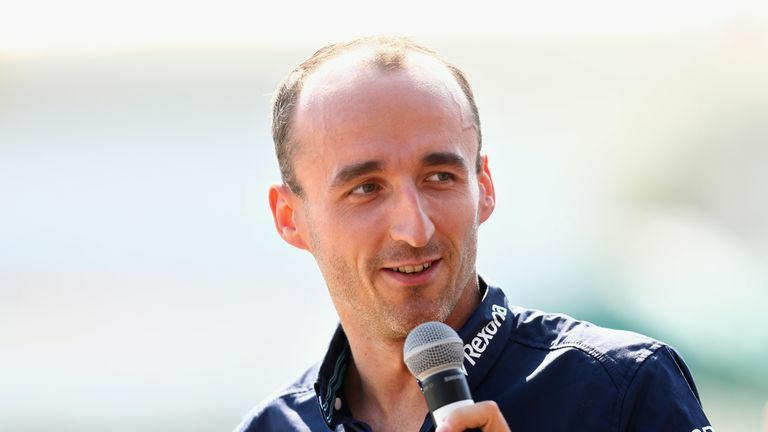 Sky F1's Ted Kravitz talks to Robert Kubica after the Polish driver was confirmed as a Williams driver next season, to partner Britain's George Russell. Team boss Claire Williams said: "He has a level of determination that is remarkable to see; and he truly embodies the Williams fighting spirit. Having the consistency of Robert stepping up into this new role will be an important step for us as we look to fight our way back towards the front of the field." Williams are poised to end the current campaign bottom of the Constructors' Championship following a desperately disappointing year. Kubica's promotion from reserve driver with the Grove outfit will be at the expense of Sergey Sirotkin, the driver who narrowly beat him to the final seat on the 2018 grid. "Unfortunately l won't be racing in F1 next year," said the Russian. "It was a very long and tough year. If l am honest, l do believe we did a very reasonable job in the current situation we find ourselves in." Lance Stroll's move to Force India is expected to be confirmed following the season-ending Abu Dhabi GP. A race return for the popular Pole will represent one of motorsport's most remarkable comebacks. Still only 33, the same age as Lewis Hamilton, Kubica had been regarded as a future world champion during his five seasons in the sport when he won the 2008 Canadian GP and finished on the podium 12 times. But after setting the pace in the opening pre-season test of 2011 for the then Lotus-Renault team, Kubica's crash during a rally in Italy inflicted severe injuries to his hand and arm that, until recently, appeared to have ended his F1 career. But in the summer of 2017, Kubica made a shock return in F1 testing for Renault, completing 115 laps to raise hopes that a full comeback was achievable. Kubica tested for Renault again at August's two-day event at the Hungaroring but was then overlooked for a 2018 race seat in favour of Carlos Sainz. The team subsequently admitted: "We don't have all the answers that we potentially wanted to get from that test." But as Williams began to consider their 2018 driver line-up options, the team ran Kubica in what was seen as a 'shootout' with reserve driver Paul Di Resta at the Hungaroring in October. Kubica then drove the team's 2017 car at the post-season Abu Dhabi test, but was surprisingly out-paced by Sirotkin and appointed reserve driver behind the Russian and Stroll instead. Almost exactly a year later, however, and one of the most unlikely - but welcome - comeback stories in motorsport history is now finally set to be completed. Just how good was Kubica? '"Arguably, in a generation that includes Lewis Hamilton, Fernando Alonso and Sebastian Vettel, he was the best of them all. "That, incidentally, was the view of Alonso. "Hamilton regarded him as the best driver he had ever encountered as they made their way through karting and up the junior car racing ladder. "BMW-Sauber didn't put up a big fight when Red Bull reclaimed its junior driver Vettel because Sauber felt that its other driver, Kubica, was so much quicker. Vettel had taken over Kubica's former role of Friday tester when Robert was promoted to the race team mid-way through 2006 because his Friday performances were simply too sensational to keep him out of a race seat, something that hastened Jacques Villeneuve's departure. "In many ways that 2006 half-season was his most impressive of all. On the high-grip Michelin tyres the team was contracted to, he was able to take an outrageous momentum into the corners, overlapping the braking and corner entry phases probably better than anyone else of the time. In his Friday role he was fastest of the field by the outrageous margin of two seconds in Montreal and out on track he looked every bit that. His driving through turns 3-4 that day remain imprinted upon my memory. "It's still visually the fastest I have ever seen anyone drive." Get the dedicated Sky Sports F1 channel - the exclusive home of all F1 next season - for £18 a month in HD with no contract. Get Sky Sports F1.